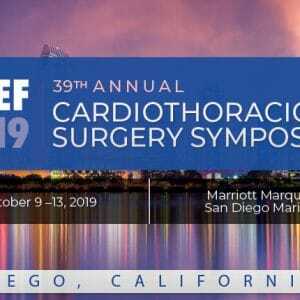 The international, interdisciplinary 39th Annual Cardiothoracic Surgery Symposium (CREF 2019) focuses on the science and techniques of cardiopulmonary bypass and extracorporeal perfusion. The conference offers cutting-edge presentations, interactive discussions, case presentations, hands-on workshops, and extracurricular education on topics related to cardiac surgery, cardiopulmonary bypass, extracorporeal perfusion, and extracorporeal life support. The 39th Annual Cardiothoracic Surgery Symposium offers Category 1 CME & CEU credits, meeting the specific educational needs of cardiac anesthesiologists, cardiac surgeons, advanced-practice providers, nurses, and perfusionists.